Beginning in January, King Cakes sneak across the Sabine River into Texas bakeries and plop onto kitchen tables via our neighbor, the great State of Louisiana. Their delicacy varies…some moist as dewdrops others dry as sawdust. The mysterious location of that small charm lurking within the recesses of sugar, flour and butter tempts even the most diet conscious to plunge in for a chance of discovery. King Cake sightings are made until Mardi Gras; then, suddenly disappear from shelf and fork. I afford them a glancing notice, preferring to concentrate my calories in the pie or cobbler category. 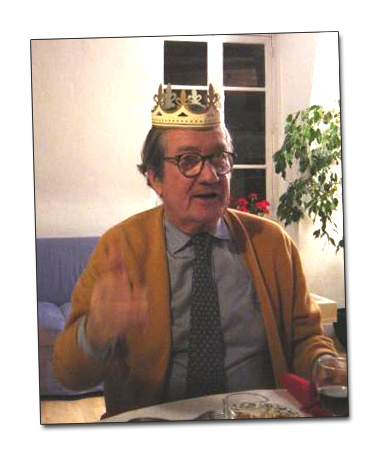 However, living in Paris challenged my indifference to the significance of the La Galette des Rois. 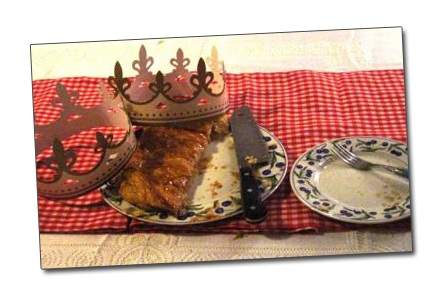 La Galette des Rois (cake of the kings) celebrates the Epiphany, the arrival of the three kings (the Magi) to honor Christ’s birth. In the 12th Century, Pope Julius II set the date as January 6th; but, in Paris, the celebration begins the first Sunday after the first Saturday of each January. The ingredients, shape and texture of these French pastries differ by region. In Paris, the cake is made of puff pastry, beaucoup butter and filled with frangipane (almond cream paste). 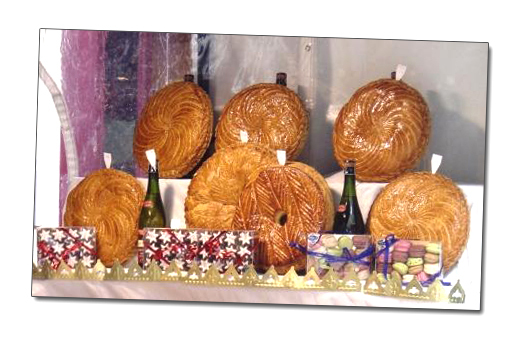 In the Provence region, the cake is shaped like a donut and crowned with candied fruit representing the king’s crown. The French colonists brought this tradition to the New World where it evolved into a product more cake-like than pie. Baked inside each cake is a lucky charm called une fève or bean. The cake represents fertile ground; the bean, a seed that produces a fruitful harvest and a year of good fortune. 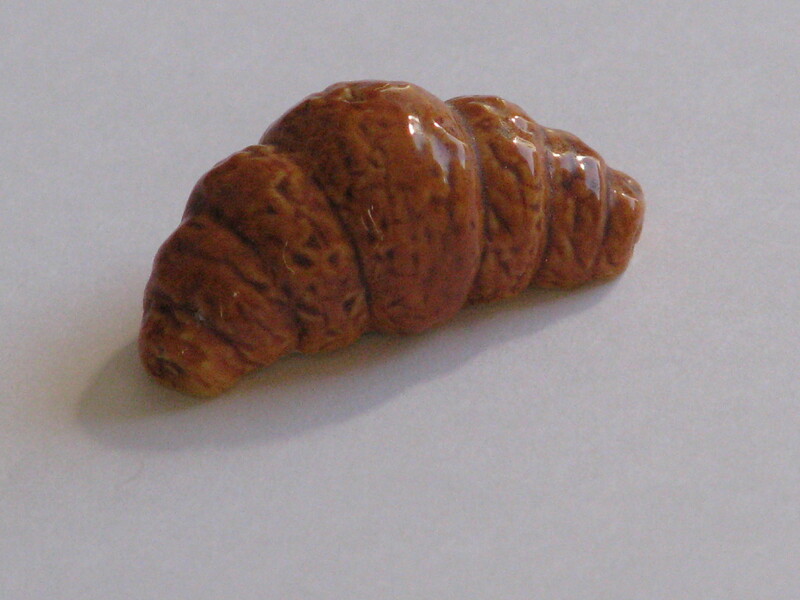 Until the end of the 19th century, the charm was made of porcelain; now most beans are plastic. Rare antique porcelain charms tout steep price tags for the collectors’ stash. The shape might be a religious figure (Baby Jesus) or the ever-popular horseshoe or the symbol of the bakery (a croissant). Tucked between your Galette des Rois and the bakery box is a gold paper crown to anoint the king (or queen) who discovers the fève hiding in his or her comfit slice. The new monarch drops the charm in another’s wine glass spreading regal wealth among the guests. Laughter, photos and delicious consumption follow. I am a miserable cook. The French are marvelous cooks. My insanity quotient was hitting stratosphere level when I invited my French, Italian and German friends to dine at my Paris flat on rue Montorguiel to celebrate the New Year. As Mom always advised, “stick with what you know, kid,” Texas chili and beer comprised the menu. What could Bernadette, Bernard, Tony and Lena know about Texas chili? I felt so…empowered! Fresh is the maxim for all French food especially fruits and vegetables. Days prior to the appointed event, I browsed the local shops for superior meat, firm tomatoes and crisp herbs. On the day, my minuscule kitchen was a-buzz with dicing, soaking and browning. Chili is always better if the ingredients have a chance to get intimately acquainted. That evening, my guests gobbled bowls of Chili, chips filled with guacamole and Pico de Gallo, plates of salad and, of course, copious glasses of wine and beer. But, the most fun was the conversation and the Galette des Rois. Bernard and Bernadette brought a large galette from one of the best patisseries in Paris, La Maison du Paul. We warmed the cake ever so slightly and everyone assumed an air of anticipation in finding the bean. Shortly into our revelry, Bernard held up the fève, a porcelain croissant. We crowned him King. He dropped the charm into my wine glass to share his evening of delight. We laughed, snapped photos and finished the evening solving the world’s problems. A final sweet treat warning…La Galettes des Rois are a delight to the palette, but not to the hips. Yummy to the last slice! About nine days ago a letter arrived in the mail with a lawyer’s return address. That’s never good news. Inside was a surprise. I owned a lot on Lake Thunderbird near Smithville, Texas. I also owed the back taxes and the Homeowners’ Association fees from….1983. Yep, those were my exact words, too . Out came the Texas map to find County Road 2104. There it was at the corner of Dead End and No Way Out. I did what any rational human being would do, I called my lawyer. Thunderbird Lake is 45 minutes south of Austin. This part of Texas has rolling bumps. Texans call them hills, but that’s a bit of exaggeration. Scrub Oak, mesquite and brush blanket the land. Being a Native Texan, I take the landscape for granted, no longer snapping to its beauty or flaws. It’s like being married to the same person for 50 years; the good and bad create the whole. July temperatures hover around 105 degrees in Central Texas. That’s way past hot; it’s ridiculous. Our motto is “start early.” By seven o’clock I had that Blues Brothers feeling…40 miles to Smithville, a full tank of gas and a half pack of iced-down Diet Coke. I pushed on my sunglasses and Hit It! It was time to speculate on some land. Rural Texas is secluded. Texas is incomprehensibly huge. Of course, you’ve heard us brag about that before. Ownership of vast amounts of land is common. One family will easily own 1,000 acres. Think of huge this way, the entire island of Manhattan is 14,478 acres. That would mean 14 families would live on the Island. As we say in Texas, “our neighbor is down the road apiece.” I drove down County Road 2104 and drove and drove. Saw three houses and two dogs before I arrived at the turn-off to Lake Thunderbird. The Jeep lurched onto the caliche road as I slowed to read the street markers named after Indian tribes: Comanche, Navaho, Shawnee. Feeling rather smug about only getting lost twice, I killed the engine in front of an overgrown lot at the southern tip of a peaceful lake. Love at first sight. I exhaled. Before I realized my own actions, I was pushing through the underbrush to the shore. There it was, Kent’s surprise gift fourteen years following his death. I squatted down, fixing my eyes on the water, visualizing me sitting in a small rowboat, coaxing a wiggly worm onto a hook in hopes of luring some granddaddy catfish to thrill me with a nibble. The sun skipped and flipped and sparkled upon the water. I smiled, got up and zigzagged back to the Jeep. I picked up the cell phone and punched in the lawyer’s number.